Lua error in Module:Location_map at line 488: Unable to find the specified location map definition: "Module:Location map/data/Uzbekistan" does not exist. Bukhara (Uzbek: Buxoro; Tajik: Бухоро; Russian: Бухара́) is the capital of the Bukhara Province of Uzbekistan. It is the nation's fifth-largest city. It had about 263,400 people at the 2009 census. People have lived in the area for at least five millennia, and the city has existed for half that time. The city is on the Silk Road. That made it a center of trade, scholarship, culture, and religion. 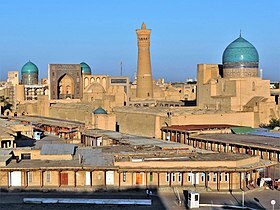 The historic center of Bukhara, which has many mosques and madrassas, is listed by UNESCO as a World Heritage Site. There are many Uzbeks and Tajiks. The city has Jews and other ethnic minorities. Bukhara was called Bokhara in 19th and early 20th century English publications and as Buhe/Puhe（捕喝） in Tang Chinese. The M37 highway connects the city to most of the major cities in Turkmenistan including Ashgabat. ↑ "UMID" Foundation, Uzbekistan. "General Info". Retrieved 2007-10-04. This page was last changed on 24 November 2017, at 14:47.